From the 24th to the 27th of July Flor Maria and I spent some days exploring Loja and its surroundings. Even today, history is alive in many parts of day to day life in Loja and currently many projects involving the research and conservation of archaeological sites are carried out throughout the province; the biggest one being probably the Qhapac Ñan with the support of the UNESCO. 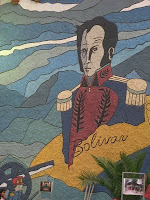 Our visit coincided with the bicentennial of the Quito Revolution in 1809, which was celebrated with a lot of music, dancing, reenactments and presentations. On Sunday we visited thePodocarpus National Park. The park exhibits an exceptional range of flora, and has beenconsidered the “Botanical Garden of America”. trails created by the national park staff. The trail “Los Miradores” took us up to 3050m altitude and due to strong wind and rain it got pretty cold but the exquisite scenery made it well worth the effort. Nevertheless we spent Monday a little more easy going, visiting the University UTPL (Universidad Tecnica Particular de Loja) and shopping in the bookstores in the centre of the city. Usually the plans for the next year start with a retrospection of the ending year. 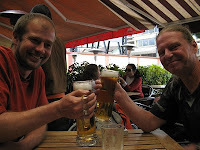 This year has been really full of travel and exploration, many of which have been planned with good friends accompanied by a cold beer (or two) sitting in the hot equatorial sun at one of Plaza Foch’s cafes in Quito. Planning our tours and expeditions is still one of our favorite pastimes and many afternoons and long nights have been filled with conversation on the best way to explore new routes. This makes it an ideal moment to thank all the many friends and family members that supported us in our endeavors, our main sponsor EGT and especially our wives once more for their endless patience and backup! 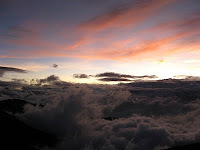 We have spent many memorable moments in the wild, camped overlooking the clouds, hiked with old friends, explored with new friends and had great times in Ecuador’s many national parks. 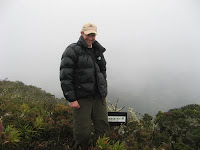 During 2009 we have made several explorations throughout Ecuador with a strong emphasis on the Mountains of Sabanilla in the Province of Loja in the South of Ecuador. We have been very successful and found three different ruins, most probably Pre-Inca sites where the Calvas, a tribe of the Nation of the Paltas, worshipped their gods. Working in Cooperation with the University of Loja (UTPL) as well as the INPC (Instituto Nacional de Patrimonio Cultural) we suggested to name these ruins “Torneados de Sabanilla”. 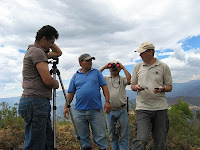 For 2010 we plan to continue the cooperation as well as our explorations of the Espindola Valley and the Sabanilla Mountain, this time also with the support of the Consejo Provincial de Loja (the Government of the Loja Province). Once more we have climbed up the high slopes of the Cordillera de Sabanilla, again with the goal to reach the banks of the mysterious lagoon called “Laguna del Tigre” said to be hidden deep inside the mountains. With the support of two mules carrying our backpacks during the first day – they returned with their owner back home at the ridge where the strong winds and rain made them shiver – we had a good start. 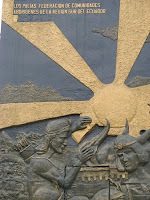 On the second day our venture was supported by surprisingly good weather. Even the sun warmed us for a few hours in the morning before the typical afternoon clouds started to come in. Nevertheless, in the late evening hours we reached the valley of the lagoon and set up our camp just below the ridge with sight over the lagoon. and its surroundings but besides an impressive flora found no hints of the ancient cultures that most probably used to hunt in this area but seemed not to live permanently here due to the cold and harsh climate. Having brought provisions for a week we decided to continue our way further south. So the next day we left the lagoon and hiked along the Cordillera de los Sabanillas, impressed by the wide and untouched mountain scenery with its immense valleys, small rivers and rocky mountain peaks. After two days we reached the “Laguna Los Huicundos” where we set camp in the evening right beside a small stone pyramid. From the ridge we could spot the lights of the small town of Amaluza deep down in the valley. In the morning we found a small path running from east to west which looked like it once was used a lot but now slowly started to disappear. Spontaneously we decided to drop our original plan to explore the Cordillera further south and instead started to follow the path towards the East. Though the path lost itself several times in the thick mountain grass (Stipa ichu), there were every now and then parts, especially in the higher rockier regions, where it was still clearly visible and we could follow it easily walking on the footsteps of the people who used it in former times to cross the Cordillera along this route (as we should learn days later from an 78 years old farmer on the other side of the mountains they ceased to use this route about 15 years ago! ).